You see a poor man begging on the road. What do you do? Do you stop to give a dollar or two? Or do you simply walk pass the man, complaining about them being lazy and unwilling to work? Or do you do something more? Whenever I drive past Chinatown, images of poverty and unemployment populate the entire neighbourhood called the Down Town East Side (DTES), infamously called the poorest district of the entire West Coast of Canada. There is heavy police presence. Well-dressed individuals are hardly seen. It is common to see people lazing on the ground, straddling across the roads, without a care in the world about their own safety. The faces tell the same story. Helpless. Hapless. Hopeless. Can the Christians do something about it? The spirit is willing but the plans are often terrible. It is a familiar cycle. It begins with a restlessness that the Church can do more. This is enthusiastically followed by a gathering of a few like-minded individuals. Exciting plans are laid out. Resources are sought out. Approval is obtained. Before long, the Church is on the way to doing something good for the poor and the needy. A neighbourhood Community Church is one example. Each Christmas, they will organize a collection of gifts for children and hungry families. With volunteers, they wrap the toys. They gather their children to do the same. They deliver them to families that have been identified as "poor and needy." Sometimes, they will even sing carols and mingle with the folks. The feeling is good. The mood is loving. It is all good. Pastor J is ecstatic and says to himself, "This is what true ministry is about." What has happened to the initial fanfare and excitement? Why are good people feeling tired from all the "good work" they have been doing? Why the change of mood? Simply put, no improvement or no progress is the single most discouraging factor for any ministry. Call it charitable fatigue or helper exhaustion. The truth is, when we try to give people fishes instead of equipping them how to fish, we will be like digging holes of codependence. Give someone the first time, and they will appreciate it. Give them a second time, and they will anticipate it. Give a third time, and expectations will be formed. Give a fourth time, they will develop a sense of entitlement. Give five times and we will have created a codependence relationship where we are the powerful giver and they are the helpless receiver. This vicious cycle of helping is not only unhelpful, it is harmful. Paul's reprimand to certain people in the Thessalonian Church is against idleness. It is not enough to say that one has faith. One needs to let that move toward action. It is not enough to say that we want to want. We need to put into action the plans we have. It is also not enough to say that we want to help. We need to do our homework on how best we can help, not just on our own terms, but what is the most helpful terms for the sake of the other person. The instruction is pretty universal. If a man will not work, he will not eat. We are what we invest in. The problem with some people is that they have a wrong sense of what faith means. Will pure prayer and fasting help an unemployed person? Will simply repeating words of faith do anything? The problem with an idle man is not whether they are able to work. It is in their unwillingness to work, choosing instead to wait for the last days to take form, while they idle themselves. The Greek word "thelo" in 2 Thess 3:10 is the same verb used for the lame man at the pool of Bethsaida where Jesus asks, "Do you wish to get well?" When a man is unwilling, questions need to be asked to rouse the man up from his sleep. The biggest problem among those of us who are poor and perpetually needy is the loss of dignity. This is especially so in a materialistic world where money talks, and where reputation flies. Rich people get all the attention. Poor people get none, apart from a passing condescending mention whenever one drives past the poor neighbourhood. Rich people can order people about while poor people gets pushed around. Rich people have materially plenty. Poor people are needy both materially and non-materially. C) Working Hard or Hardly Working? Don't get me wrong. I am not against prayer or fasting. I am also not saying that faith is unimportant. We need to be people of faith that is demonstrated through faithfulness with what we already have. If you have legs, walk. If you have eyes, see. If you have ears, hear. If you have hands, work! Honestly, sometimes the best advice one can give to an idle man is to rebuke him for any inaction. That said, it is also important to appreciate the circumstances behind each poor person. This calls for wisdom and discernment in any desire to help. Are there physical weakness we do not know of? Are they trapped in a system that abuses or prevents them from growth? Are they able to walk on their own two feet now, or do they need temporary hand-holding? We need to balance affirmative action with grace. Many churches in North America are considered quite well to do. They contain a sizeable number of affluent individuals who are able to provide lots of material help. Just think of short-term mission trips. We see far more North American churches sending teams to the poorer nations than the other way around. Have we ever taken the time to consider the two questions and which reflects the reality better? #1 - We help others based on what they truly need. #2 - We help others based on what *WE THINK* they need. True help begins when we learn to recognize our own brokenness first, before we can help others. It is because the world is broken, we see life being strewn about in broken pieces. There are people with emotional hurts. There are those with physical handicaps. There are also people who really try to find employment, but have been rejected over and over again. There are people who are victims of the system. There are the despondent and the depressed, the tired and the lonely, the down and out. Only when we develop the eyes of Jesus, can we attain a heart of compassion. Then, and only then, we will learn to let our brokenness, motivate us to reach out to others. Tom is a well to do Christian. He goes to Church, has a nice house, a well-made car, and a cushy job. He too wants to do good. He even gives to charity regularly. Yet, he is always complaining about how the poor are not helping themselves. He is right, but also wrong. 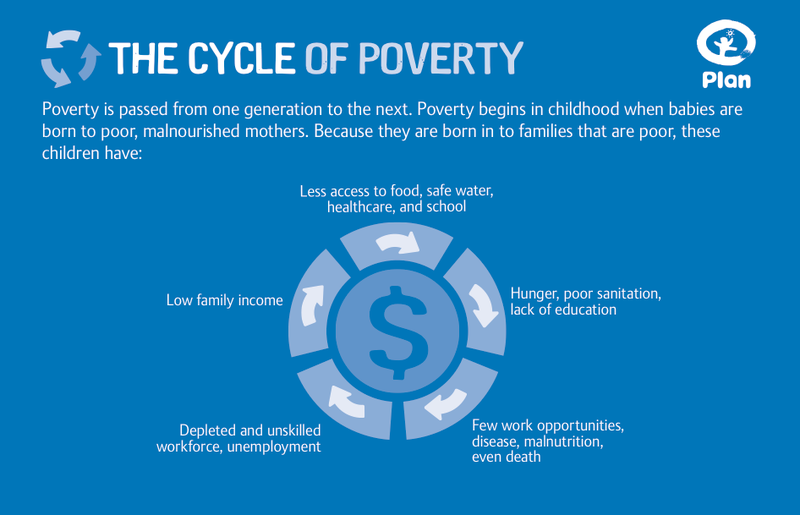 Right in the sense that there is no improvement in the poverty cycle. Wrong in trying to straitjacket poverty into one single problem. 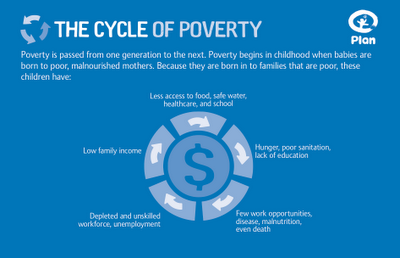 The truth is, poverty is an extremely complex problem. There is a different story behind each individual poor. There is a unique tale behind each beggar. Poverty never really gets resolved because far too many well-intentioned individuals fail to understand the complexity of the poverty world. 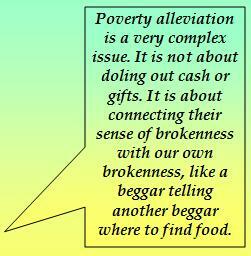 Poverty alleviation is a very complex issue. It is not about doling out cash or gifts. It is about connecting their sense of brokenness with our own brokenness, like a beggar telling another beggar where to find food. The community Church, Pastor J, Tom, and many people have good intentions. However, good intention alone is not enough. I will even call it Step 0. Step 1 is about recognizing our own brokenness. As long as we fail to recognize our own brokenness, we will cause more harm than good in the long run. Let me offer a start. We can all pray. We can all read Scripture. We can all talk about helping. If you really want to start, true helping begins by knowing the person you are trying to help. Take time to talk. Take time to pray for that person. Take time to understand the story. This ability to "take time" must come from an important source: To recognize that we too are broken people. When this happens, we are ready to really help. THOUGHT: "True helping is not about giving things away. True helping is about walking along with the needy in a way that is helpful for them, according to what they really need, not what we perceive their needs to be." Before Your Shop.... Turn the T.A.P.